There's been a lot of talk on soap making forums about using Aloe in CP soaps and after reading some advice from people who experimented with it I decided to give it a try, cause it was a cheap adventure this time having all of the ingredients in my kitchen and garden. First I cut a leaf from my aloe plant, washed it and cut the sides wich have small thorns on it. Peeling the leaf was actually the hardest part of this process, cause it's difficult to remove all the green bits from the gel since it's so slippery in your hands. Then I added some distilled water to aloe gel. Those who have experimented with adding aloe to soap advise us to make it half aloe-half water puree, but while I was adding water I got some 5 g. more of it in the bowl and didn't want to bother with extracting it, it doesn't make a lot of difference anyway. I didn't want those green bits in my mixture, so I took some time to remove them before blending them in my multi. This time I wanted my soap round, so I used a Pringles box that I cut the bottom off, turned it bottom up and lined it with wax paper on the inside. I used some plastic wrap on the bottom side, then put the cap on and an elastic band arround the plastic wrap to additionally secure it. When you measure your oils, use a lye calculator, such as this one to calculate the amount of caustic soda and water you'll need. Then substract the weight of aloe puree (aloe & water) from the weight of water needed to dissolve the caustic soda, at least that's how I did going by the logic that it was liquid mixture, kinda like a thick natural juice. Follow the CP procedure as usual and add the aloe vera at light trace. When the mixture is ready, pour the soap into a mold and that's it. This is how my Olive oil & Aloe Vera soap turned out. It was rather soft after 24 hours of insulation and you could actually see small spots of aloe gel in it. It got a lot harder after a couple of days. Хвала Весна :) Јеси пробала да направиш сапун као што смо причале? Well, I see from your posting date that this batch was created more than 3 months ago and should be able to be used now. Do you notice a difference? Did it go rancid with the live plant material? I am just starting and was looking for info on substituting Aloe Vera Juice for the water. Every post I read said it didn't make a difference in the quality or properties of the soap other than for branding. Sorry, I just notices that I accidentally answered you in the comments below (back in July) and not as a reply to your comment/question so you probably didn't get a notiffication. Please scroll down in the comments and see the answer. Thanks for reading my blog. After long searching on the internet I finally found this! I really want to try it, but actually I don't really understand everything. I've already made soap of pure olive oil. When do you add the aloe? Do you first mix the NaOH en water, and then stir it all, with the aloe in the olive oil? I'm looking forward to your answer. Hello and thanks for reading my blog. First mix caustic soda in water as usual, except that you have to discount the weight of your water by the weight of aloe puree that you will use later. Per example, if you are making 100% olive oil soap superfatted by 5%, the recipe will say that you use 63.650 g Sodium Hydroxide and 165.00 g of water or some other liquid. 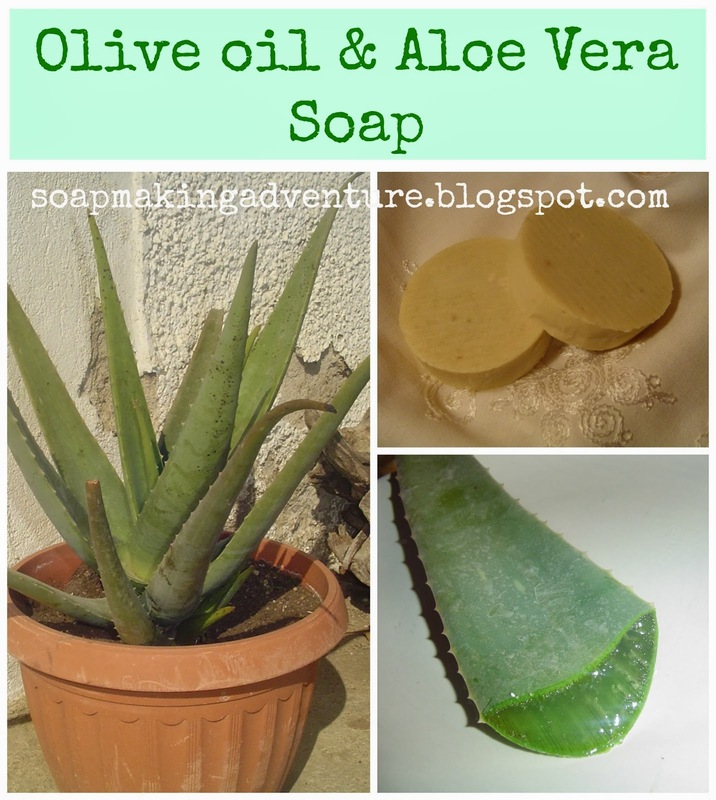 Let's say you want to add 50 g of aloe puree in your batch of soap; 165g - 50g= 105g water. That's how much water you will use to make lye solution. Then pour the lye solution into your oil, mix just a bit, until it makes a very light trace and then add aloe puree (aloe+water). Something else - after trying it this way, one thing I wish I did was to process aloe in the blender before adding water into it. I kinda mixed them together in blender and it didn't dissolve that well, so there were small bits of aloe visible in the bars of soap which is not a bed thing I guess, but I think it would look better if I processed it more. I hope this was helpful. Good luck with your next soap making adventure and if you like you can send me some photos and your own experience and I will add them to this post. Hi very good post, got a valuable information about Aloe Vera and its uses. Just figured I would give you a little tip - you made a castille soap - 100% Olive Oil soap needs a much longer cure time than regular recipes. The gooeyness was due to it not being cured long enough. I would say anywhere between 6-12 months is a good time frame for castille. The longer it sits, the more gentle it is on the skin. Thank you Alicia. That could be it. I know castille soap needs much longer curing, but I could never wait that long to try it :) When it comes to soap, I'm like a kid who can't wait to unwrap a present. What was your experience in using Aloe in soapmaking?